Strong evidence for water in the atmosphere of the hot Jupiter Tau Boötis b has turned up, thanks to work by Geoffrey Blake (Caltech) and graduate student Alexandra Lockwood. But what’s intriguing about the find isn’t the water — we’ve found water vapor on other planets — but the method of detection. Lockwood and Blake used a modified radial velocity technique that has previously been deployed to detect low mass ratio binary stars. A top-flight instrument like the Near Infrared Echelle Spectrograph (NIRSPEC) at the W. M. Keck Observatory in Hawaii can separate the planetary and stellar components spectroscopically to produce this result. Image: Simulated data showing the method used for detecting water vapor features around the hot Jupiter tau Boötis b. In this example, the planetary signal has been increased in strength by several orders of magnitude relative to the actual signal. The dotted lines show the blue- and red-shifts of the planetary and stellar lines in the data, respectively. Credit: Alexandra Lockwood/Caltech. Thus the toolkit of exoplanet science continues to grow. We already know how to study planetary atmospheres when a planet transits its primary as seen from Earth, allowing us to separate direct light from the star from light that has passed through the atmosphere. Another way of studying an atmosphere is through direct imaging, but here we rely on planets far enough from their host star that we can separate them from the star’s glare, the classic problem of planet hunters. But a non-transiting world like Tau Boötis b demands a different approach, and the spectroscopic separation of radial velocity signals appears to be one solution. It was back in 2012 that two independent teams studying Tau Boötis b were able to separate the radial velocity of the planet from that of the star by studying shifts in the spectral lines of carbon dioxide. The technique as expanded into the infrared now gives us the molecular signature of water. I should mention here that a team in 2010 detected carbon monoxide in the atmosphere of another hot Jupiter, the much studied HD 209458 b, a detection that provided what researchers call the ‘spectroscopic orbit’ of the system and thus revealed the true mass of the planet. …this technique can be applied to non-transiting, RV-detected exoplanets to extract the unknown inclination and true mass. CRIRES [the High-Resolution IR Echelle Spectrometer installed at ESO’s Very Large Telescope] was also used to detect CO on τ Boötis b (Brogi et al. 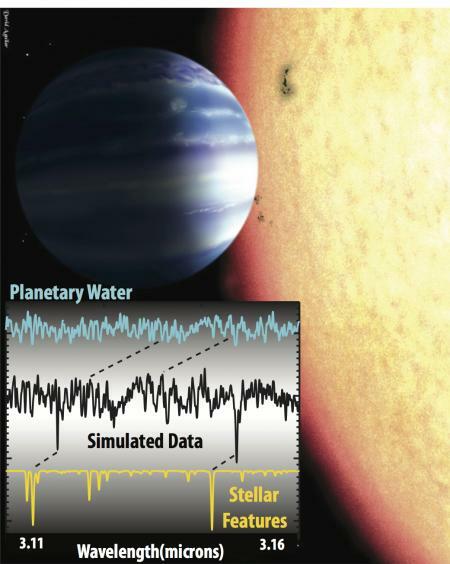 2012), the first ground-based detection of a short-period non-transiting exoplanet atmosphere, a result confirmed shortly thereafter by Rodler et al. (2012). These studies provide the true mass of the planet and probe the chemical composition of its atmosphere. A combination of high signal-to-noise, high spectral resolution, and coverage of multiple CO overtone lines was required to achieve the sensitivity required for these detections. So by finding the signature of water in the atmosphere of Tau Boötis b, the Caltech team is also extending work that creates what Lockwood calls the ‘3-D motion of the star and the planet in the system.’ It’s a method that deepens our understanding of the planetary system by giving us a true mass reading, and although at present its applications are limited to close-in gas giants like Tau Boötis b around nearby bright stars, the hope is that improvements in telescopes and infrared spectroscopy will extend the method to smaller planets around dimmer stars. The paper is Lockwood et al. “”Near-IR Direct Detection of Water Vapor in tau Boötis b,” The Astrophysical Journal Letters, published online 24 February 2014 (preprint). Well, we knew that, but the really interesting question is: at which mass is the boundary between truly earthlike and mini-Neptune? The articles are not entirely clear about this, but my impression is that the upper limit for earthlike is somewhere around 2 – 3 Me. Also with regard to my previous comment, the earthsized category (< 1.25 Re) is growing rapidly. Previous post: A Formation Mechanism for Pulsar Planets?